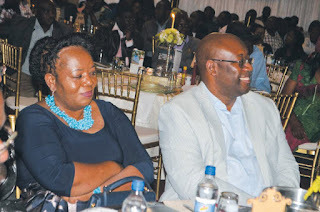 ZVISHAVANE - Mimosa platinum mine on Thursday, September 20, held a farewell dinner for company's former managing director, Winston Chitando who is now Minister of Mines and Mining Development. Speaking at the event, Mimosa general manager, Alex Mushonhiwa said after serving for 20 years, Chitando had given his all to the company and the company was happy that his skills were now benefiting the nation. "We have been working with Winston for the past 20 years. During his time here at Mimosa, he was a man who walked the talk. With him, we witnessed the growth of the company to become one of the most prosperous in the whole world. We are beneficiaries of his succession plan. "If we had powers to reverse the appointment to government, we could do that but that would not be fair. We cannot deprive the nation of a man like Chitando," said Mushonhiwa. Newly-appointed Minster of State for Midlands Provincial Affairs, Larry Mavhima said Chitando's departure from Mimosa came as a blow yet a blessing to the whole of Zimbabwe. "I am honoured to celebrate the time that Chitando spent here. I remember in 2012, Chitando contributed to the 9 km fencing of Masase High School in Mberengwa, built classroom blocks at Makwasha Primary School and Mutshingwe Primary School. "He even renovated Harare Hospital, Mpilo Hospital, Gweru Provincial Hospital and Zvishavane District Hospital," said Mavhima. Local Government, Public Works and National Housing minister, July Moyo hailed Chitando for laying out a clear succession plan. "I am impressed by the way he exited Mimosa. Sometime in 2013 he told me that he was going to leave Mimosa before yearend not knowing that he was going to soon feature in the cabinet," said Moyo. In his own remarks, Chitando expressed gratitude to Mimosa and the community for giving him a chance to serve and honouring his services. "Now that I am the Minister of Mines and Mining Development, my next move is to develop Sabi Gold mine which holds the country's biggest gold reserve," said Chitando. Local traditional leaders; chiefs Wedza, Mafala, Mapanzure, Masunda and Mazvihwa were present together with Members of Parliament (MPs) for Zvishavane-Runde and Zvishavane-Ngezi constituencies Cuthbet Mpame and Dumizweni Mahwite respectively. On behalf of all chiefs in Zvishavane district, acting Chief Mapanzure praised Winston Chitando for helping to develop Zvishavane community.